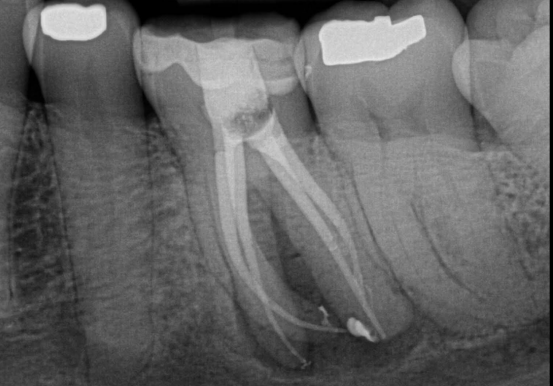 After diagnosing tooth #19 with necrotic pulp and chronic apical abscess, I proposed RCT for a 66-year-old woman. 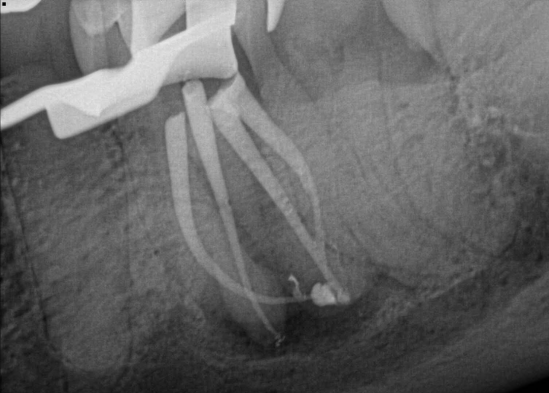 Challenges in the case include obtaining a glide path to working length, calcified canals and some tricky curvature. The flexibility of ProTaper Gold files proved useful. After the case, I reflect on the importance of establishing a glide path. This case involves a 66-year-old female with an extensive medical history. She has a history of High Blood Pressure, High Cholesterol, Anxiety and recent discovery of Melanoma and Breast Cancer. She has a history of chemotherapy and radiation treatment and currently takes Anastrozole, Zocor, Lexapro and HCTZ. She also has had some blood transfusions and an allergy to Levoquin. Her chief complaint was that the “dentist saw something on the x-ray, but [I] didn’t have any real pain.” Now that she was done with the majority of her cancer treatment, she had time to take care of the infection in her mouth. The radiograph shows tooth #19 restored with a composite filling. The PDL is thickened and the lamina dura is diffuse. 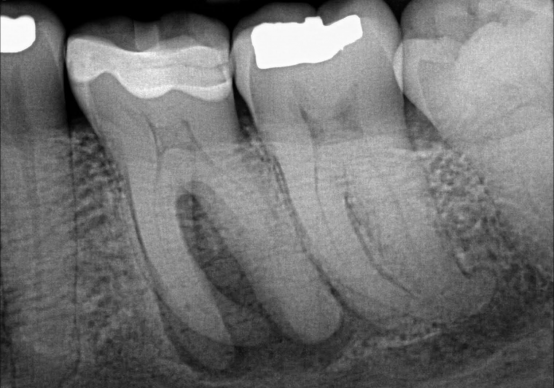 There is a large periapical radiolucency associated with tooth #19. The radiograph also demonstrates some apical calcification. Clinically, the tooth has a draining sinus tract. The tooth had normal probing depths, no pain to percussion and no response to cold. The tooth was diagnosed with Necrotic Pulp and Chronic Apical Abscess. The access was relatively straightforward, although there was a pulp stone in the chamber. The canals were 22mm long and obtaining my glide path to working length was probably the biggest challenge in this case. First, I used C files and EDTA in order to achieve patency. I used my endo handpiece in conjunction with my C files to be a bit more efficient with the process. The second challenge was the curvature of the MB root. Calcification plus curvature is a recipe for a separated file, so I like to give this part of the process a little more TLC. Once the glide path was established, I was confident that my rotary was ready to go. My go-to is always ProTaper Gold, especially in a case with a curvature like this one.I can feel confident that it will go around the bend with ease. For me, this type of metallurgy exhibits more flexibility and just works better in my hand because I don’t feel so much resistance. Throughout the procedure, I used copious irrigation of 6% sodium hypochlorite. When I was up against any calcification, I switched to 17% EDTA to help get through any blockage. Once my instrumentation was complete, I performed a final flush of 5cc of 17% EDTA and 5cc of 6% sodium hypochlorite. My master apical file was a 25/.04 on the mesial canals and 30/.04 on the distal canals. There were 4 canals in total. I use a hybrid technique of S1, S2, F1 and then switch to a ProFile 25/.04 and 30/.04. In this case, I did not activate my irrigants because I don’t find that effective in cases where I have very narrow canals. But, I like to use a 30-gauge ProRinse needle during my irrigation so I can get maximum needle penetration for better irrigation. I obturated the tooth with warm vertical condensation and sealed using ThermaSeal Ribbon Plus Sealer. A flowable composite was placed over each orifice as an orifice barrier and a sponge and cavit were placed. The patient was referred back to her GP for the final restoration. In a case like this, the biggest take away is establishing your glide path so that you can be safe with your rotary files. Don’t expect your rotary file to create miracles – instead, learn how to care for it, just like anything else. No rotary file is foolproof, but if you take the time to give your rotary exactly what it needs, it will make your life so much easier and keep your treatment safe. Thank you – I appreciate you following! 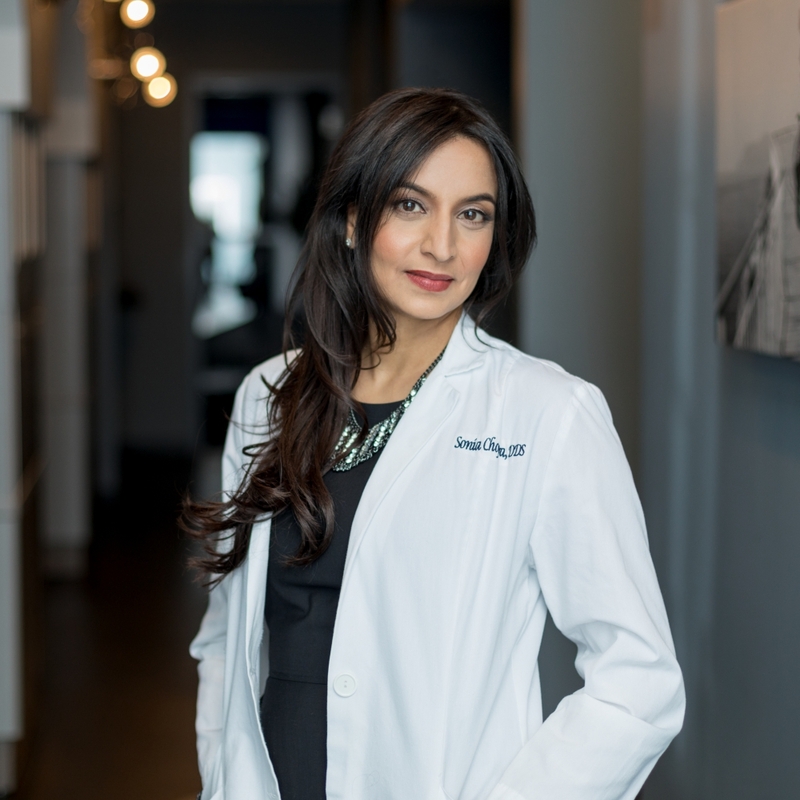 Way to go Dr. SONIA. The thrill of the fill. Heart warming, re-affirming in CE. Looking forward to your future posts/cases. Thank you so much Andrew! So cool to have your support! Do you like the Wave One Gold files? Also, for warm vertical condensation, are you going to 5 mm from the apex? Do you use a back fill gun? Which one do you like? Nice finish. Hi there!! I haven’t really used the Wave One Gold yet, but I may start to try them out a bit more. I just get stuck and happy with a file when I like them. It’s hard for me to change. I have been using ProTaper for years and my hand is used to them now. And yes I go 5mm from my working length and I use a back fill gun. My favorite is the Hot shot since it is cordless. Beautiful Endo! My favourite file is Wave one Gold. It’s really the only rotary file I have used in vivo. Nice post,very infomative … u said u used profile after F1 … which size Gp was used to obturate ? Hi!! I used a 20/.04 master cone to obturate. My pleasure – I’m so glad you’re reading!